Dentists in Delano are taking note of a study that was released by the American Dental Association, which states that brushing without toothpaste could be an important part of your oral hygiene routine. ‘Dry brushing’ — the act of brushing the teeth without toothpaste — has been found to be more effective for removing plaque than brushing with toothpaste, according to the study. 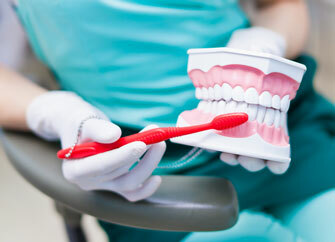 In fact, 128 participants who tried dry-brushing for six months saw a 67% reduction in plaque buildup. Researchers also noted that the presence of bleeding and gingivitis was also reduced by 50%. Start with a dry toothbrush: A toothbrush that is soft and dry brush will scour away sticky bacterial plaque more effectively than a wet one. It’s okay to ‘relax’ stiff bristles by running your thumb across them before you begin brushing. Try a 45-degree angle: Placing the brush at a 45-degree angle towards the gum line will help you to target that plaque that accumulates near the gums. Brush the inside first: Start brushing on the inside surfaces of the bottom teeth first, and then move to the inside surfaces of the top teeth. These are the most commonly overlooked areas of the mouth. Lastly, brush the outer surfaces to complete the job. Massage the gums and teeth: Think of dry brushing as a mini massage for the gums and teeth. Move the brush in a gentle, circular motion, rather than a hard scrubbing motion. Slow down: Dry brushing should be slow and thorough. Use as much time as you need to brush all of the teeth. Expect to spend at least two minutes on the routine, but the process can take up to five minutes if necessary. Make it smooth: Brush until every surface of every tooth feels smooth. When all of the plaque has been properly removed, your teeth should feel as smooth as they were after your last professional dental cleaning. Do you have more questions about how to dry brush? If so, contact a dentist in Delano for an appointment today.